The Ramada of Marquette, family owned and operated since 1973, is your home away from home while visiting the Marquette Area. Whether you're staying for business or pleasure, our staff is here to provide you with warm hospitality and exceptional service. We pride ourselves on creating a memorable experience for each and every guest. Our full service hotel is conveniently located downtown only blocks away from beautiful Lake Superior, Northern Michigan University, and Marquette General Hospital. We're one block away from Marquette's bike/foot path that circles around the city and within walking distance of many local shops, restaurants and parks. For those who are here on business, our property includes all the modern amenties. Some of those amenties include high-speed wireless internet, fitness center, business center, conference/banquet facilities, indoor pool, hot tub, sauna, and laundry facilities. We offer a wide variety of room types, so we're sure to have one that suits your needs. Our on-site restaurant, Harley's, serves breakfast, lunch and dinner with daily lunch and dinner specials. Harley's Lounge, our on-site bar, features local craft beer, specialty cocktails and fine wines. 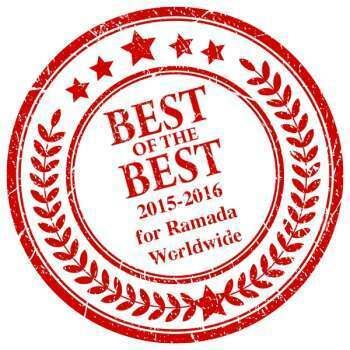 Ramada Marquette has been awarded "The Best of 2015-2016" by Wyndham Hotel Group, ranking it among the top properties of the brand's 900 hotel portfolio. The Ramada has distinguished itself as a leader amongst the brand, setting itself apart through outstanding performance in areas such as customer service, revenue generation and overall quality.